Wall Street is set to open higher Wednesday after the U.S. midterm elections showed the Democrats winning control of the House of Representatives and the Republicans keeping a majority in the Senate. Though the election results increase the potential for political gridlock in Washington, the outcome was mostly expected, so markets have not been as volatile as after other political events, such as the 2016 presidential vote. Futures show the S&P 500 and Dow Jones industrials opening about a half a percent higher, while the Nasdaq is poised for a gain of closer to 1 percent. Republicans had discussed a new round of tax cuts if they maintained full control over Congress, a move that would have expanded the government's deficits further and required it to issue more debt. Government bond yields spiked overnight after a batch of strong early results for some GOP candidates, but then headed lower as Democrats' fortunes improved, making a new tax cut package unlikely. The yield on the 10-year Treasury note went as high as 3.25 percent Tuesday night from 3.21 earlier in the day. On Wednesday morning it dipped to 3.20 percent. The US dollar also weakened in the morning. 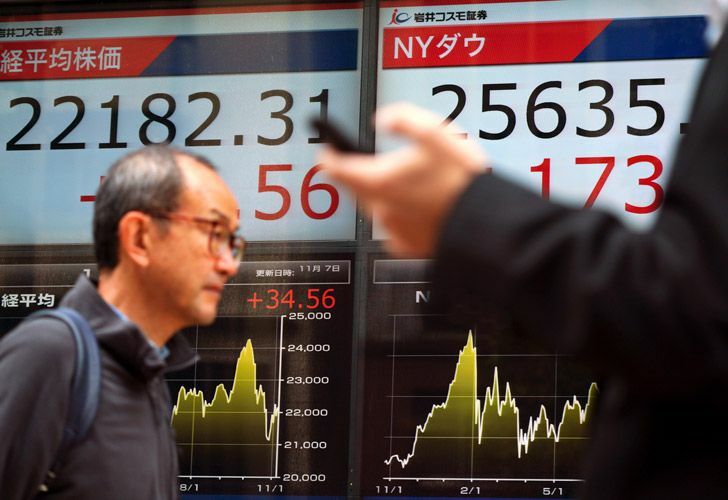 The US currency fell to 113.22 yen from 113.40 yen, and the euro climbed to US$1.1487 from US$1.1413. Major indexes in Europe climbed. The French CAC 40 jumped 1.3 percent, while the DAX in Germany rose 1 percent and Britain's FTSE 100 gained 1.1 percent. "One thing is for sure - the cloud of uncertainty from the last few weeks has lifted," said Mike Read, founder of social trading platform Pelican. "Underinvested traders will return to the markets." The US markets swooned in October — the S&P 500 fell about 7 percent — as investors worried about rising interest rates and the US-China trade dispute. Both the S&P 500 and the Dow are showing small gains so far in November. October is historically a rough month for stocks, and markets usually rise after midterm elections regardless of how the political landscape may change because Wall Street is glad to have more certainty. The election had implications for various sectors of the market. Marijuana growers were on track for gains Wednesday morning after voters in Michigan passed a ballot measure to legalize marijuana, while Missouri became the 31st state to approve marijuana. Utah was also considering that step. A marijuana legalization measure in North Dakota was defeated. Shares of Medicaid program administrators could rise after Idaho and Nebraska both voted to expand the Medicaid programs. And a couple of oil drillers, Anadarko Petroleum and Noble Energy showed strong gains in premarket trading after Colorado voters rejected a measure that could have sharply reduced oil and gas drilling, including the method known as fracking, by requiring new oil and gas wells to be farther from occupied buildings than allowed under current law. It's not clear how the election's outcome will affect the Trump policy Wall Street might be most concerned about: his pursuit of an "America first" trade strategy that has drawn the US and China, the world's two biggest economies, into a trade war. A primary concern in Asia is the potential for trade tensions to hobble growth for export-reliant economies. Trump has imposed penalty tariffs of up to 25 percent on US$250 billion of Chinese imports, and Beijing has responded with tariffs on US$110 billion of American goods. Konstantinos Anthis, head of research at financial services firm ADSS, said Trump will "definitely have a tougher time getting his legislative initiatives through Congress" but that this in "shouldn't be a dampening factor for the dollar itself in the long term."